Due to issues with line flooding and coal shortages we have rescheduled our inaugural tour to the North African country of Eritrea giving you the opportunity to escape the British winter and experience an exceptional ‘Connoisseur’ rail holiday that is brimming with culture and steam journeys. Bookings have re-opened for this 12-day tour, priced at £3,250pp, which we have also amended to allow more time to explore this small state situated in the Horn of Africa and boasting an extensive coastline along the Red Sea. Travel time on this tour has been reduced substantially and will not include a return journey via Alexandria and Cairo as stated in the original itinerary. If still not convinced then consider the tour's major highlight, a journey by chartered steam train on what is known as the ‘Darjeeling of Africa’. This 950mm narrow gauge railway travels through spectacular scenery as it climbs over 7,500ft from the Red Sea to the Eritrean capital Asmara. 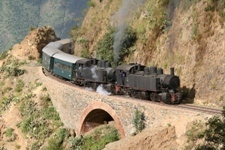 Read the full itinerary of this revised tour on our Eritrean Steam page on our website at www.ffestiniogtravel.com. To chat through any other details regarding this tour contact us direct on 01766 772030. If the dates for this tour aren't convenient we will be running another Eritrean tour in late October 2014, see details here Eritrea and Cairo.